I'm getting more and more confused about the de Chirico painting that I've been writing about last week. 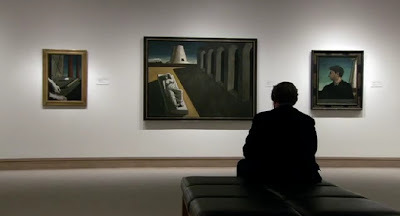 I just watched Robert Hughes' The Mona Lisa Curse and took a screen-shot of him sitting in the Met, looking at three de Chirico paintings, the one on the left being Composition Metaphysique. This one-hour episode came out last year, so was probably filmed in 2007 - early 2008. Why is it there? Still can't find anything about the Hillman loan. It's possibly a different painting (a copy), something that de Chirico was known to do. I've stopped using capitals, nothing to do with this, but now that I'm writing a bit more than I was at the start, its a spacer-saver thing...fractal savings.